Taipan Publishing Group Offers a Free Download of "Your 19-Minute Encyclopedia of Successful Investing in Emerging Markets"
BALTIMORE, MD--(Marketwire - May 1, 2008) - Investing in emerging markets is the new safe harbor as the U.S. dollar continues to tank. Around the world, a new currency has emerged to dislodge the ailing dollar. This new currency takes the form of precious metals, fossil fuels and cash crops -- tangible and tradable commodities not tied to any central bank. As developing nations fill the soaring demand for oil, uranium, corn, silver and other vital commodities, their own economies develop overnight. Once that happens, they are able to decouple from the influence of the U.S. and the sinking dollar. Their unexpected financial independence offers investors perhaps the fastest way to cash in on the biggest economic revolution in history. --  Cashing in on the biggest commodity boom in history. Now you can receive "Your 19-Minute Encyclopedia of Successful Investing in Emerging Markets" absolutely FREE. In this simple guide, you'll quickly grasp the tactics, strategies and trends of possibly the biggest economic revolution -- ever! "Imagine turning back the clock on the U.S economy by 50 years... and how much money you'd now have if you invested in the stock market or real estate or infrastructure. That picture captures the opportunity available to you today in emerging markets," says S. Lee Franks, Executive Publisher, Taipan Publishing Group. 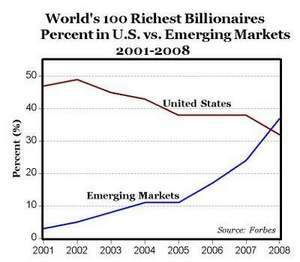 That's why emerging markets are expected to contribute over 60% of global growth in 2008 compared with 48% last year. This process is slowly bringing down the global share of U.S. GDP while the share of emerging markets is steadily rising. With commodity billions boosting local emerging economies, the injection of foreign capital adds volume to the country's stock market and long-term investment to the infrastructure. The nation then embarks on economic and political reform, appeasing local investors who keep their money local instead of sending it abroad as in the past. Transparency and efficiency take root in the capital market. Exchange rate reforms become more favorable for foreign investors. Employment levels rise; labor and management become more sophisticated. As overall production levels increase, the country's GDP improves. It begins to close the gap with mature economies -- and decouple from the ailing U.S. economy. The Taipan Publishing Group produces 16 investment e-letters and advisories on emerging markets, commodities and equities. For more information, please visit www.taipanpublishinggroup.com.